One of the problems with waiting for the Google Play Store to replenish its inventory of Google Nexus devices is that by the time you hear about it, the devices could be sold out again. You can just imagine how high the demand is for the $349 16 GB Google Nexus 4 since it seems to sell out inside of 30 minutes everytime it goes on sale. But there is an app available that will push a notification to you whenever there is a status change on any of the devices. The app is designed to look like the actual product page on the Google Play Store and you can customize the app to monitor the entire Google Nexus line-up or just those devices you want to know about. You can also set how often the app checks the status of the devices from as often as every minute, to as long as once a day. 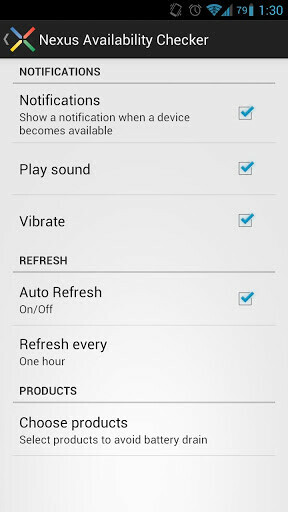 The default setting is for Auto Refresh and the app will play a sound and vibrate when there is a change to report. The beauty of installing this app is that it could be the difference between getting to the Google Play Store in time to buy the Google Nexus 4 when the next batch is on sale, or getting shut out. And for us in the media, installing this app gives us the chance to scoop the competition the next time any of the Google Nexus line is available. According to the app, everything is sold out at the moment. The Nexus Availability Checker gives you the price of each device in local currency and also gives you a link to the Google Play Store. You can download it free from the sourcelink. I can see it now. 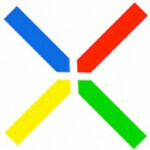 10:36 PM THURSDAY 12/27/2012, THE NEXUS DEVICES ARE BACK IN STOCK. 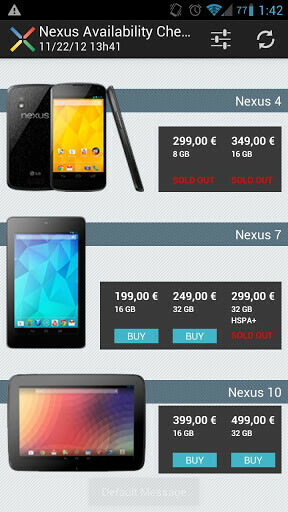 10:37 PM THURSDAY 12/27/2012 THE NEXUS DEVICES ARE OUT OF STOCK. 10:38 PM THURSDAY 12/27/2012 YOU POST YOUR COMMENT. Good for you! Would you like a trophy as well? Well I had a buggy as hell nexus 4. Got another one off c list and again found the hardware to be subpar. Camera sux and the wifi would cut on and off and also hspa 4 g. With the bumper case it bcame way to Huge so I just traded mine for an s3 again. Truely the most reliable android and perfected android headset as of right now. Really sux bc I reallly wanted to ljke the nexus 4. Do you know of any good cases for the Nexus 4, and if so could you link me to them? I've been searching forever and all I've found were soft TPU cases, but I want an actual protective case. They should make this app for iPhone. iPhone users are more likely blind to other non-Apple products. That's pretty unnecessary. They actually need an app for that? Why not just send an alert or an email?